Depress the trigger once for a continuous supply of hot melt adhesive, totally effortless to use. Tec 6100 and Tec 7100 pneumatic glue guns are ideal for covering large areas or when you need glue fast where “smaller” glue guns simply cannot cope with the demand and are a serious alternative to bulk tank hot melt systems at a fraction of the cost. 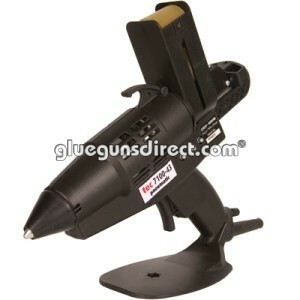 The Tec 6100 and Tec 7100 pneumatic glue guns are built in the UK to a very high standard – Glue Gun Standards – and are the flagship tools within the Tec range of glue guns. These tools are designed for the most demanding applications, robust, rugged and a reliable production tool, plus exceptional value for money. Tec 6100 – Highly efficient heater housing and 500 watt power (twin 250w heaters) make it ideal for the most demanding applications – capable of dispensing up to 4.1 kilos of molten hot melt per hour. The TEC 6100 operates using large 43mm adhesive cartridges and can never run out as a cartridge always remains in the gun at the right temperature. Re-loading takes just seconds and is indicated by an audible and visual signal, minimising down time. Available in Hot Melt or Low Melt and 240v or 110 volt for on-site use. Tec 7100 – Massive 1000 watt power available on demand. Operating temperature is obtained in only 5 minutes from cold via one of the 500 watt cartridge heaters, then when the trigger is pulled for use, the second 500 watt heater comes into operation and enables the molten adhesive to be dispensed at a constant temperature. The most unique feature on this tool is the built-in speed loader, which holds an extra two 43mm glue cartridges in reserve. Plus, it also enables the user to re-load in seconds whilst continuing to use the tool. Available in Hot Melt or Low Melt and 240v or 110 volt for on-site use. Both the Tec 6100 and Tec 7100 glue guns have a guarantee against faulty workmanship, materials and malfunction for a period of 12 months from the date of purchase when used with Tecbond 43mm glue slugs. 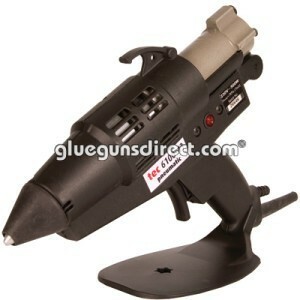 We strongly recommend the use of Tecbond 43mm glue slugs within the Tec 6100 and Tec 7100 pneumatic glue guns. Further details on the dangers of using inferior competitor glue slugs within Tec glue guns.